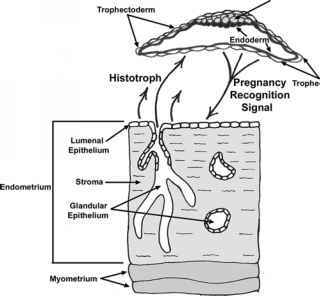 Hair follicles develop in the skin during fetal life. Primary follicles, which form first, are generally larger, have an associated sweat gland and erector muscle, and produce longer, coarser fibers called guard hairs. The smaller, secondary follicles generally produce shorter, finer fibers forming the undercoat or down. Animals with two distinct layers to the coat are double-coated (Table 1). Skin follicles undergo cycles of active fiber growth and molting. In most species, the cycles are synchronized, primarily by day length, to provide a pelage appropriate to climatic conditions. Genetic selection of fiber-producing animals, such as the Merino sheep and the Angora goat, has increased the total number of follicles, reduced the differences between primary and secondary follicles (producing a uniform single fleece), and increased the length of the growing period to what is, effectively, continuous fiber growth.